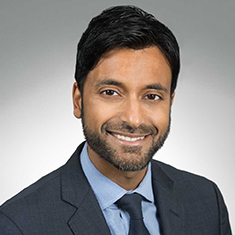 Deepro Mukerjee is the national co-chair of Katten’s Patent Litigation practice. For nearly 20 years, he has litigated patents and other intellectual property rights relating to a wide variety of technologies, from pharmaceutical compounds and biotechnology processes to electrical circuit interrupting devices and computer software programs. An experienced Hatch–Waxman litigator, Deepro is involved in dozens of Paragraph IV litigations on behalf of some of the largest pharmaceutical companies in the world—often taking these cases to trial and subsequent appeals. The scope of his pharmaceutical practice extends to being lead counsel on several past and current inter partes review (IPR) proceedings. In addition to his substantial litigation experience, Deepro often advises on complex, patent-centric due diligence projects and provides intellectual property counsel to multinational corporate clients for complex transactions, such as public offerings and venture capital financings. He also counsels companies in better leveraging existing and newly constituted IP portfolios. Deepro is a frequent university guest lecturer and has been recognized by the IAM Patent 1000 for several years in a row. Shown below is a selection of Deepro’s engagements. Lead trial counsel for a premier processor and distributor of amniotic surgical tissue grafts in breach of contract and tortious interference case pending in the US District Court for the District of Maryland; co-counsel for the same client in a patent infringement action in the US District Court for the District of Alabama. Lead trial counsel in the US District Court for the Middle District of Florida involving a patent directed to a controlled release of mesalamine. Successfully obtained a Rule 36 affirmance from the US Court of Appeals for the Federal Circuit affirming the original trial court victory. The affirmance was entered in less than 24 hours after oral argument. Lead trial counsel for a leading online provider of employment-related services in a patent infringement action in the US District Court for the Southern District of California. Successfully argued a case-dispositive Markman hearing which led to favorable settlement. Lead trial counsel for one of Europe's leading voice recording companies in a patent infringement action involving patents related to voiceover IP. Invalidated nearly all of the asserted system claims at the Markman stage. Lead trial counsel for a sponsorship-driven, social-media marketer in a patent litigation in the US District Court for the Eastern District of Texas. Successfully obtained a stay by petitioning the USPTO to accept a covered business method petition on several of the asserted patents. Lead trial counsel for a high-end jewelry designer in a copyright infringement matter involving novel questions of law relating to the availability of copyright protection for jewelry designs; case settled.